Teach Flute: Aldo Baerten - My Way to Music! As a small child, my parents, who both were amateur pianists (although my mother had also studied music, she became a history teacher) often took me to the children's concerts in Brussels which were then organized by the national orchestra with its most charismatic conductor. One day I must have heard and seen this shiny, bright, brilliant instrument in the middle of the orchestra and probably fell in love with it. Who still REALLY remembers why he is playing an instrument? I loved the cello also very much, but as we did not have a cello teacher nearby, it became a bright and shiny flute. As most of the kids in my country, I started out by just doing one full year of solfège (note-reading, singing, rhythms,...) without playing the instrument, but as the solfège teacher was very funny and hilarious, it was quite ok! And then after one year, I could finally start the flute....which at first did not interest me more than any other kid. I would practice rather little to very little, and always got good grades, so I did not care too much and played a lot of tennis and read books. What changed this whole way of being with music and flute playing, was my change of school! At age 10, I moved to the European School in Brussels, which was originally a school for diplomat and EU-workers’ children, but they had a spot in their class, and I was accepted. It was a normal secondary school (with secondary school starting at age 11, but as I was a year early, I could already start my high school at age 10), with a particular point: it had loads of culture, going from music, over to theater, to chess club. My great luck was to get into the musical course with an English teacher, himself a wonderful oboist who became a wonderful friend and supporter of mine -- Adrian Knott. This is the man who changed my life. Not only were his music lessons interesting, full of passion, very active and most rewarding, but he was also the man behind all the musical activities in this school of 3500-students. The school had a band, a school orchestra, a yearly operetta, a choir with parents and students, and lunchtime chamber music concerts. So, very soon, he got me involved in most of these activities, which I enjoyed very much, although he had to push me sometimes (as with any young kid) to not skip rehearsals. But what a joy, what an excitement to go on orchestra tours, to perform an operetta 3 evenings in a row, to play chamber music (often with himself playing the oboe), and to get possibilities to perform on my flute in recitals and even with orchestra! This was it ! But still, I had no idea I wanted to be a professional musican. I just had the joy of playing !!!! By the end of my highschool however, around age 16, I was sure I was not going to be a musician at all, but rather a diplomat. Being in a diplomat school showed me how interesting these lives could be, and I decided that I was (anyway) not good enough for the flute and would go to university to study political science. But then hesitation came: could I live without this flute, without the music? And hesitation came even more when my future professor of the Brussels Conservatory told me I was talented and should pursue my path...what to do? This question went on and on, even after I had passed my audition for the conservatory, and was accepted. In September I also applied for University in political science and was also accepted...and of course the decision became urgent... I decided, one day before school would start to try music for a year and then, if it were not my path, I would switch. Music must be studied at a young age, and I could still become a diplomat later....but later became never ! After a very short stay at the Brussels Conservatory and graduation after only 2 years, I absolutely wanted to pursue my studies in another country. I started to look around, applied for a few schools in Germany, and won a spot at the Hannover Musikhochschule (which I did not take) and at the Basel Academy of Music in Switzerland with my idol, the man with his unique tone and expressive, intelligent interpretations -- Prof. Peter-Lukas Graf! I still admire him today, and at age 83 he remains an example to me every day. Four wonderful years were ahead of me, years of learning so much, sometimes struggling, but with incredible energy and passion guiding my path. In those years I also won my first job (which I immediately left after a few weeks, because it conflicted too much with studying), played in the most marvellous youth orchestras (EUYO, SchleswigHolstein, WorldYouth Orchestra) under conductors I could only dream of such as Abbado and Haitink, and at the same time, I started teaching at a small music school nearby, going back and forth to Switzerland every week for my lessons at the Musikhochschule there. 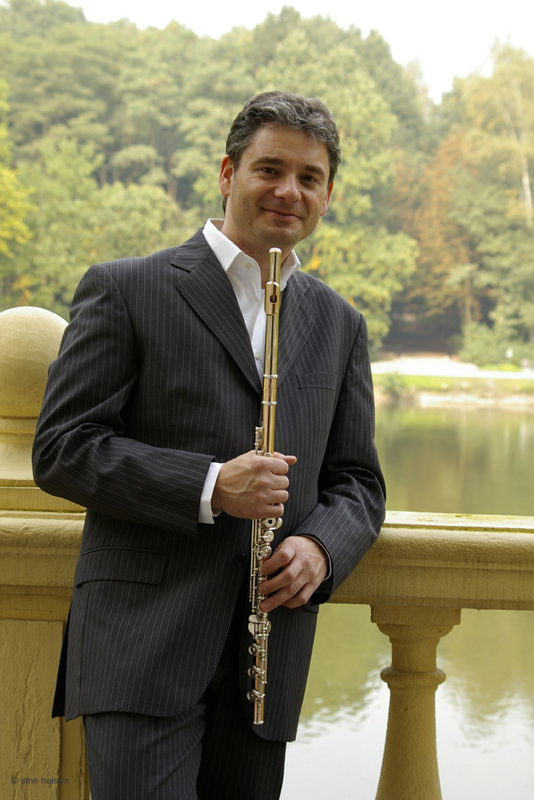 After graduating with the Soloist Diploma, I was scared to death I would not be able to do anything with my flute ....I decided to continue my studies with another of my idols, the principal flute of the Bavarian Radio Orchestra, Philippe Boucly, who I had heard in Brussels. I admired his colourfoul playing, French and elegant, and his natural way of being with the flute and music! I studied for another year with him in Munich, whilst I already won the audition and began playing as Principal Flute in the Royal Flemish Philharmonic, now conducted by Maestro Edo de Waart. Whilst playing there, I got in touch with my third idol and admired flute player, Jeanne Baxtresser, then the Principal Flute of the New York Philharmonic Orchestra. Every time she was in Europe, I would listen to her concerts, play for her, and learn from her! She is, was, and stays an example for me, with her gorgeous sound, her clear ideas, her wonderful warm playing and her humour. A few years after I started playing in the orchestra, I became Professor at the Antwerp Conservatory, in the same city as my orchestra, and a few years later started simultaniously at the Utrecht University of Music, which is in Holland and where I usually go 2 days every two weeks. My life now is divided by playing in the orchestra, which has 2 Principal Flute Players, and thus gives me time to do other things in life, such as chamber music, solo playing, lots of teaching, travelling with the flute around the world, swim and run, and occasionally relax, garden, cook, read and enjoy my great friends.